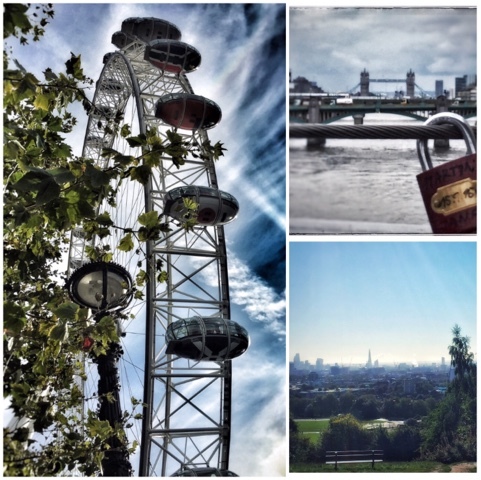 I adore London, it's my favourite city in the whole world. I love the city day and night, the people, the languages, the stores, the sights, the quiet parks in the middle of town, even the smoggy, smelly, crowded tube! The city has a very lively, friendly and down-to-earth atmosphere. It feels like coming home. Cakes in the pastry shop in Harrods; aren't they pretty? The British food isn't known for being overly delicious or elegant, but I can't help but loving it. 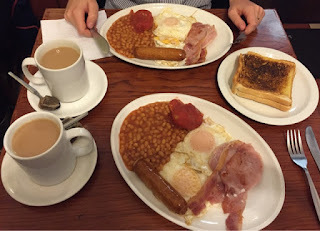 I'll take you through some of my favourite British dishes and restaurants. Let's start with the most important meal a day: breakfast. I'm not much of a breakfast-person. I always leave home in a rush, and usually have "breakfast" (which is a banana) at work around 10:30-ish? But this is definitely one I can enjoy in the weekend. Fried eggs, toast, tomatoes, beans, sausage, bacon and tea. Happy full English! <3 it's an absolute carb bomb (especially beans on toast, nomnom!) but it's so good. And quite satisfying if you've got a busy day. Usually more ingredients are added, like mushrooms or black pudding. It's one of britains most famous meals. Can you believe that people already ate this in the Victorian era? Tea. 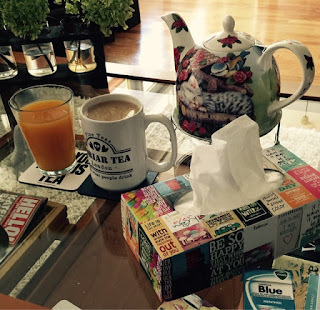 Tea. Tea. 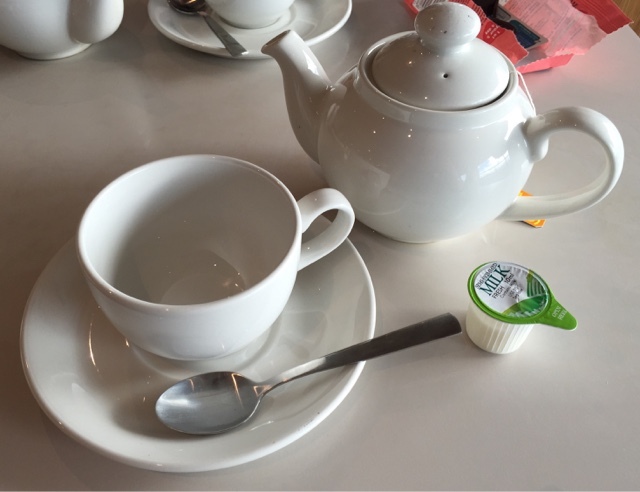 When you think of England, you think of TEA <3 My favourite tea brand is Twinings, and it's used everywhere in the UK. Happy me! <3 Also, just a tip, try the Strawberry Tea from Harrods. It's lovely! 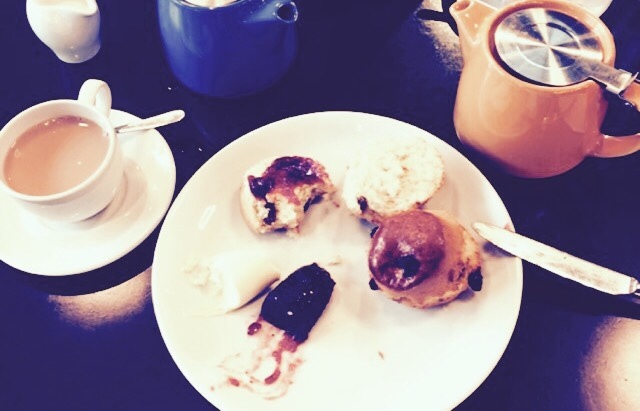 Now that we're talking about tea..
Skipping lunch and moving straight to the Afternoon Tea. 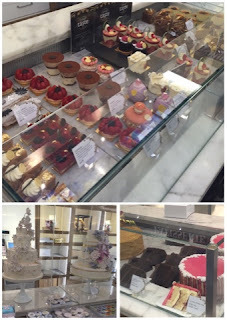 I told you before: I have a sweet tooth so Afternoon Teas make me very very happy! This Afternoon Tea is quite a simple one, containing only scones with jam and clotted cream and tea. During a very traditional Afternoon Tea you will also find finger sandwiches and other pastries, like a slice of Victoria Sponge. Scones aren't very known in Holland, but nowadays you can buy them easily at Mark & Spencer. Every round was served separately, also refreshing the teacups and plates. It was very well taken care of. For me, that is the perfect High Tea. When you talk British, you talk Fish & Chips. Period. The best (very greasy) meal in Britain, traditionally served in an old newspaper, with lots of malt vinegar on the chips. 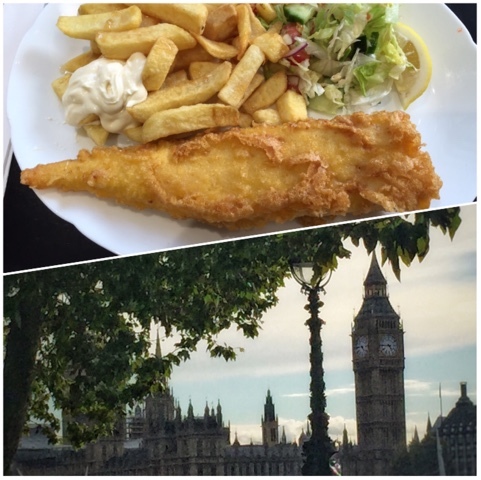 Combine the jummy food and a gorgeous view: there is no better place to enjoy Fish & Chips than on the South Bank. For the (rare) moments you don't feel like having Fish & Chips, there are lots of other places in London to have supper. There is a Pret a Manger on every corner, of course the widely known McDonalds and Burger Kings, you can also eat a bunch for not too much money in China Town. But this holiday, my friend took me to a place I've never heard of before: Nando's! Only meals with chicken are served, but the quality and service is divine. Will definitely return!! 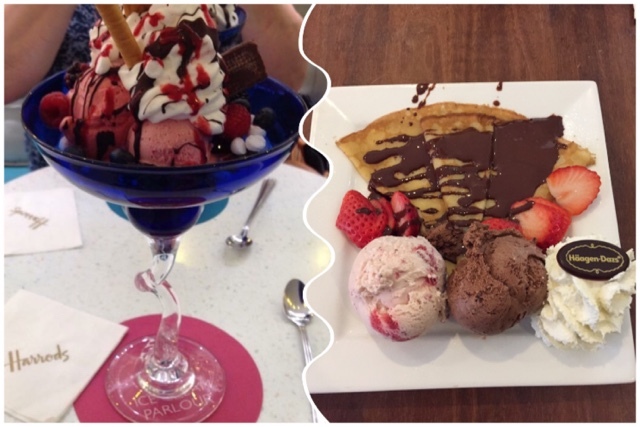 One time, my mom and I went to the Harrods Ice Cream Parlour for ice cream. As you can see from the picture, it's a HUGE ice cream. They put so much effort in it, It's almost a pity to eat it! I can also recommand going to the Häagen-Dazs store on Leicester Square. They sell scoops of ice cream but there is also a restaurant with a big variety of dishes. I can keep going on and on and on about the food and restaurants in London but I will leave it with this :) Unfortunately I have caught a cold on the last day of my holiday in London. Now at home, I am covered in blankets, with a big pile of tissues next to me and a nice, big, hot pot of tea. 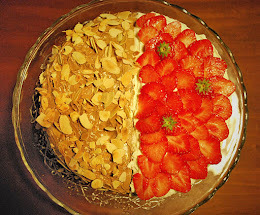 As soon as I'm better again, I will bake something spectacular! Unfortunately I've never been, but I'm saving up! :) The flights alone will easily cost me a few thousand dollars (I live in Singapore now) and if I want to shop and dine I better save up a lot! ^^; Anyway, if you ever come here you can let me know! 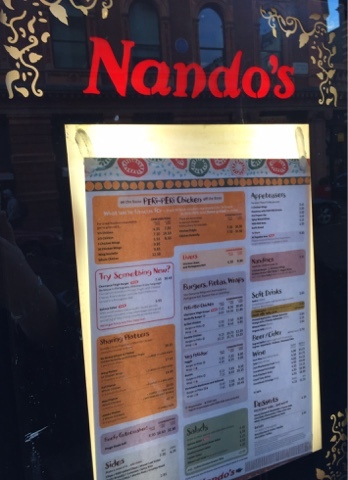 I can bring you around (and to eat Nando's; my treat ^^).